When you get sick of your spiritual dating site, you might like to try using the Kleem mantra for attraction. With the kleem mantra for attraction you will have the power to create love and attraction that is irresistible. In my Ultimate Guide To Mantras I shared everything you need to know in order to use mantras successfully. And one of the mantras I mentioned in that guide was Kleem. 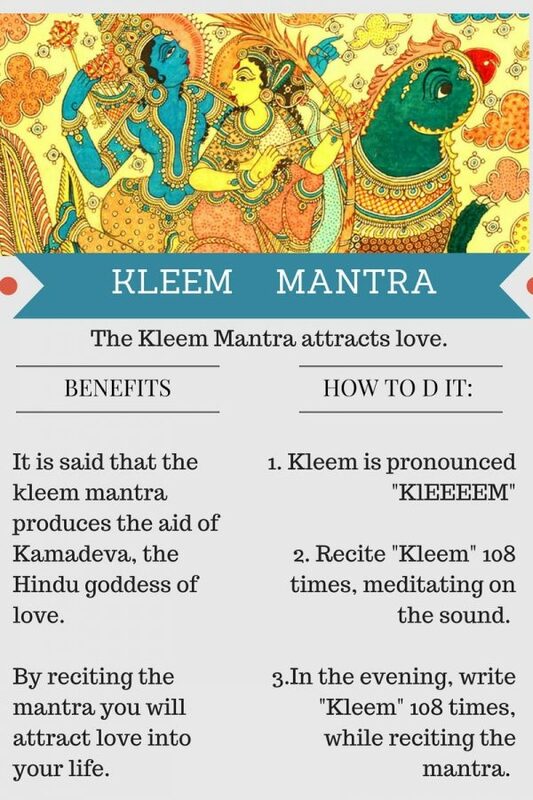 Kleem is one of the most powerful love mantras. You use Kleem for attraction, to make other people want you. It is a very powerful mantra for men to attract women. But does it work? And how do you do it? Kleem is one of the oldest spiritual techniques used to create attraction. And it is one of my 30 Secrets To Spiritual Love. Kleem is very closely linked to another mantra, “Sheem”. Shreem is the mantra associated with Nature’s beauty, love, and abundance. Kleem is the sound that attracts those qualities to you. So, when you chant “Kleem” you will bring the beauty, love and abundance of nature into your own life. You can feel the energy of this mantra for yourself. Try making the sound “Kleem”. You will notice that Kleem has a unique feeling–it creates vibrations / reverberations in your body. When you focus on this mantra and meditate on it you change the frequency of your spirit. When you change your vibrational rate you change your relationship with the universe (which itself has its own vibrancy rate). That is how a mantra works. And when you recite Kleem you create irresistible attraction. DID YOU KNOW: Mantras like Kleem and Sheem work by changing the vibrancy of your energy. Try reciting the mantra “Kleem” one hundred times now. While you do this, focus on the sound of the mantra. All mantras have very specific pronunciation. If the words of a mantra are mispronounced, the mantra will not work. The kleem mantra will work only when it is pronounced correctly. So please try pronouncing it many times now. and keep going until you are confident that you have it right. The next step of the kleem mantra is to follow a specific procedure. Note: To learn mantras correctly I highly recommend that you read THESE BOOKS because they explain mantras in-depth. So, how to do Kleem mantra. Read my ultimate guide to practicing mantras . It will fill you in on vital info you need to know. Kleem uses the chakras. For it to work, you need to start by opening your chakras. Breathe in and recite “Kleem” six times while exhaling. The sound should resonate. While chanting, it’s necessary to focus on specific chakras within the body, as follows. Finally, recite while allowing the mantra to resonate throughout the whole body. In the evening, write KLEEM 108 times (or more). The more times you write it, the stronger the effect will be. As you write the mantra, chant it too. For best results, combine this with a meditation for sexual confidence. 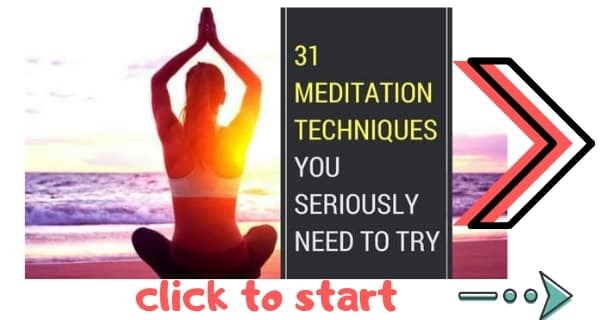 I highly recommend using this meditation for love too. This article was submitted by a guest blogger. You can read about the author in the post above. If you would like to submit an article, please write for us (sponsored guest posts). Paul Harrison, Editor, THE DAILY MEDITATION. This is one of the Best Resource which I found on Kleem mantra via Google. I am even trying it to attract my Loved one. Your Article helped me to find some answers to my Questions and some are pending. Which part should be elongated? A few times on this page, or the previous, you have both “kleem” and “shreem”, but you have “shreem” spelled “sheem” w/o the “r”. Intentional? Or a type-o? this one really works, immediate effect the next day. really power mantra, sound vibration is unique indeed. It’s pronounced, “KLEEEEEENM”, as you get to the last part: try to make the back of your tongue touch the back/top of your throat so that last part of this beej mantra sound comes from the nose. Hello on another thread it says kleem is chanted with elongated M? Yes, that is correct.. The longer the better.